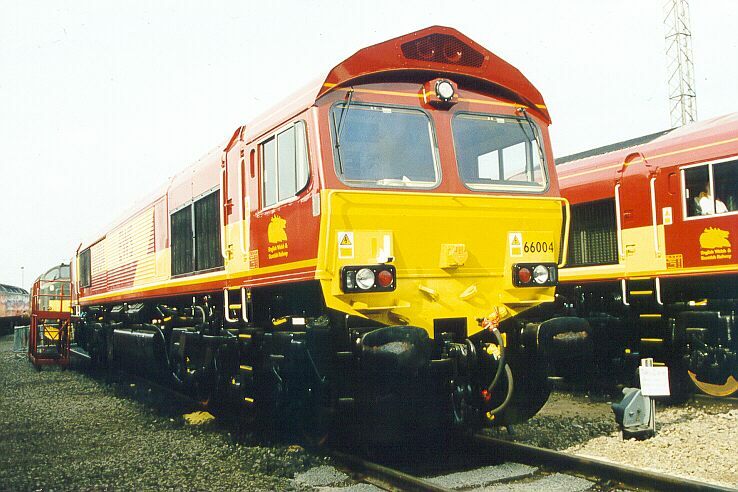 The new order for EWS, the GM built class 66 is represented in this view by newly delivered 66001 which is standing at the head of a line of various types of wagons in EWS livery while on display at the EWS Toton depot open weekend on Sat 29th Aug 1998. 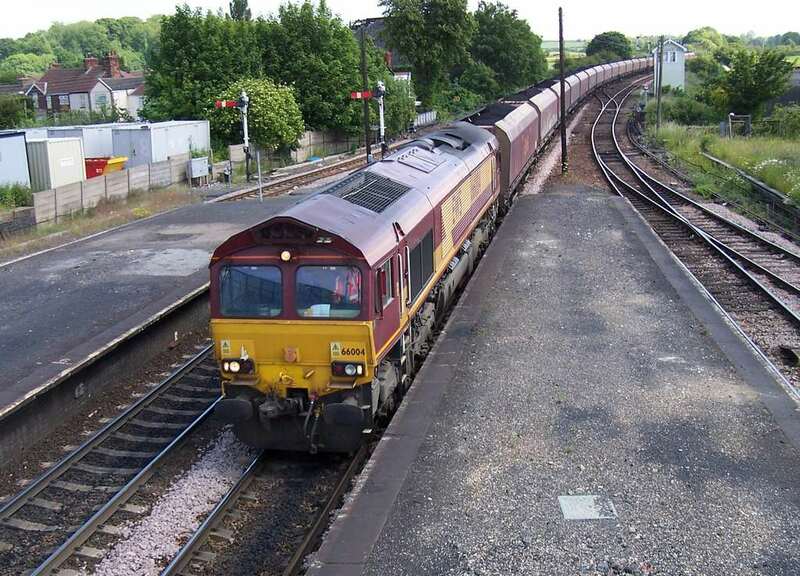 EWS Class 66 diesel locomotive 66001 hauls a westbound freight train of empty steel wagons through Newport station in South Wales. 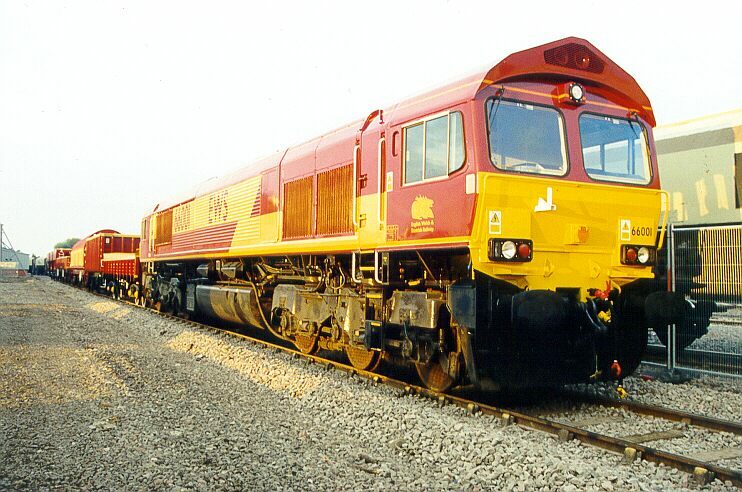 66001 awaits it's next turn of duty with an M.G.R (coal) train at Falkland Yard, Ayr on saturday 31st July 1999. 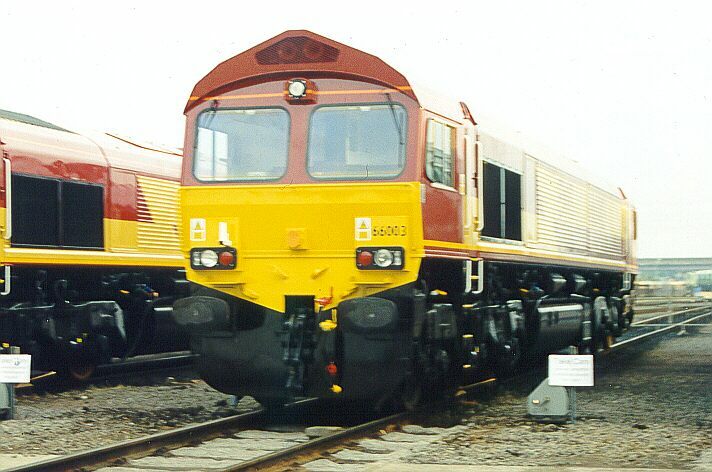 66001 on display at the EWS Toton depot open weekend event on Sat 29th Aug 1998. 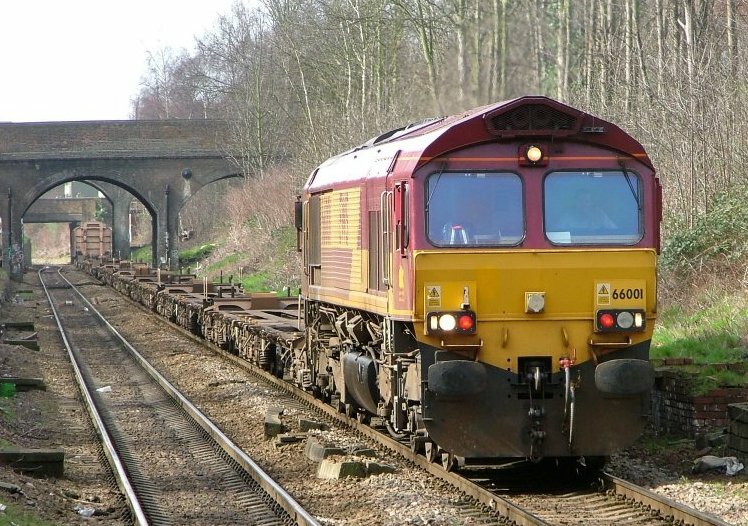 Notice how the gold band on the 66's are split-levelled in a lightning style format compared to a straight gold band allied to other classes. 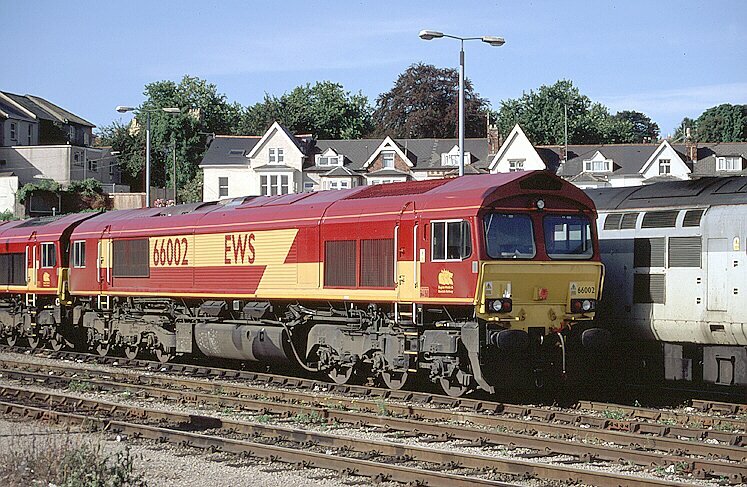 66002 awaits it's next turn of duty at Newport Godfrey Road on Sun 12th September 1999. 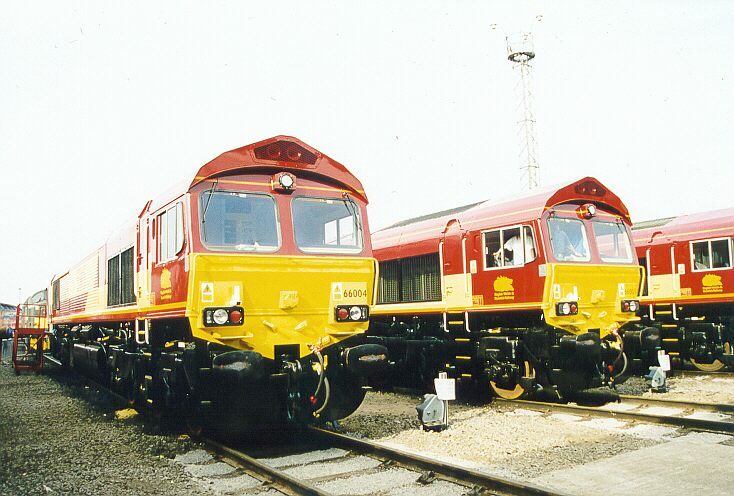 66002 & 66117 stand next to 37509 at Newport Godfrey Road on Sun 12th September 1999. 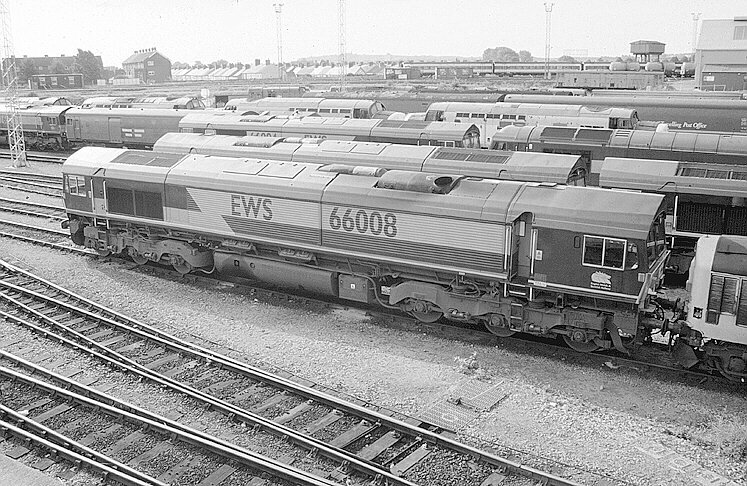 The new order for EWS, the GM built class 66 is represented in this view by newly delivered 66003 which is seen on display at the EWS Toton depot open weekend on Sat 29th Aug 1998. 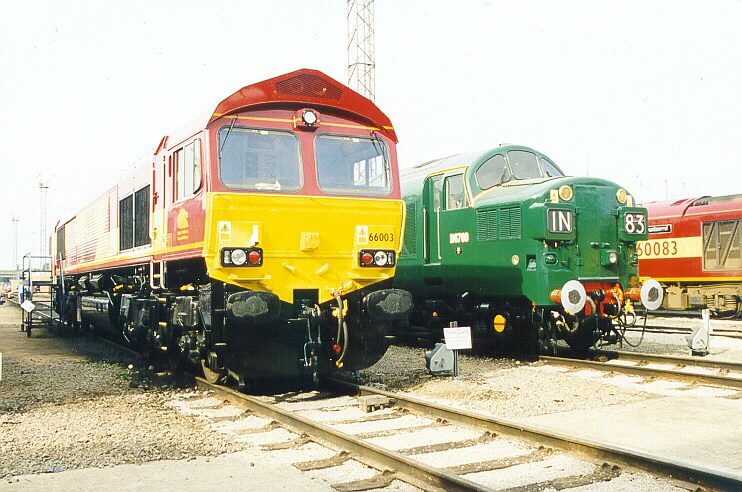 The new order for EWS, No: 66003, Stands alongside the old order for EWS, No: D6700 (37350) at the EWS Toton depot open day on Sun 30th Aug 1998. 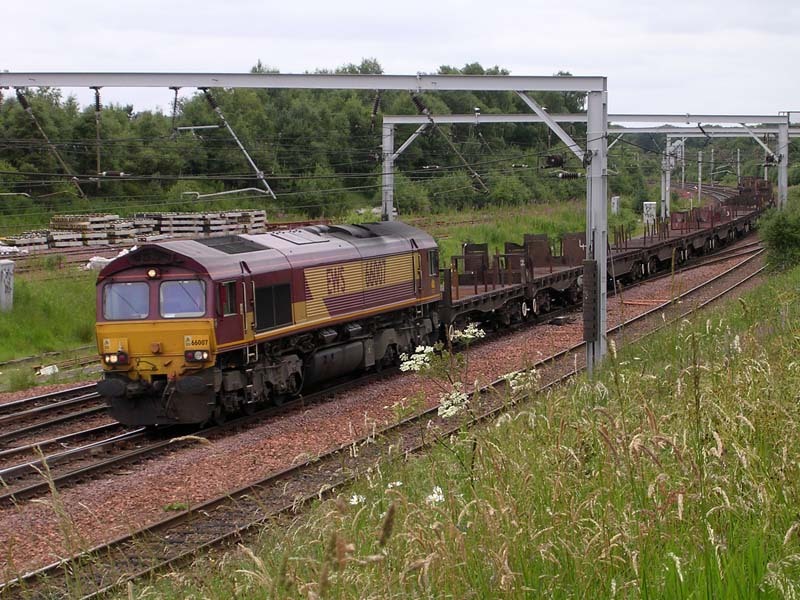 EWS Class 66 - 66003 approaches Carstairs with an unidentified loaded M.G.R/Coal working on Fri 15th July 2005 at 13:38. 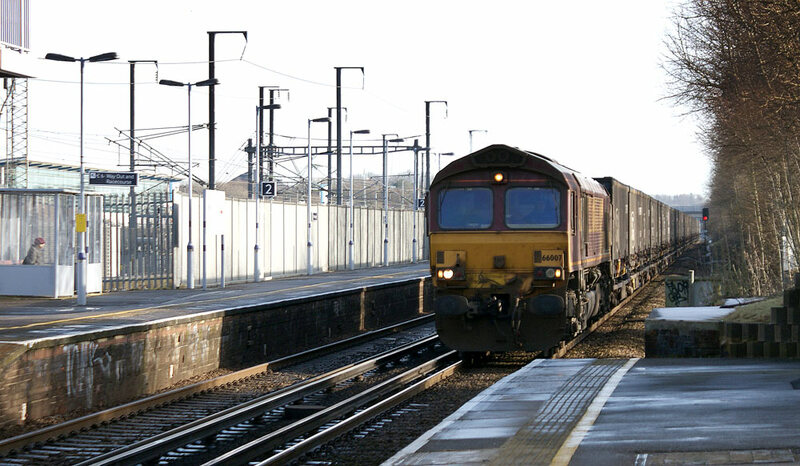 DB Schenker locomotive 66003 with a train of empty car wagons, crossing Canute Road after leaving Southampton Eastern Docks on 10 October 2012. 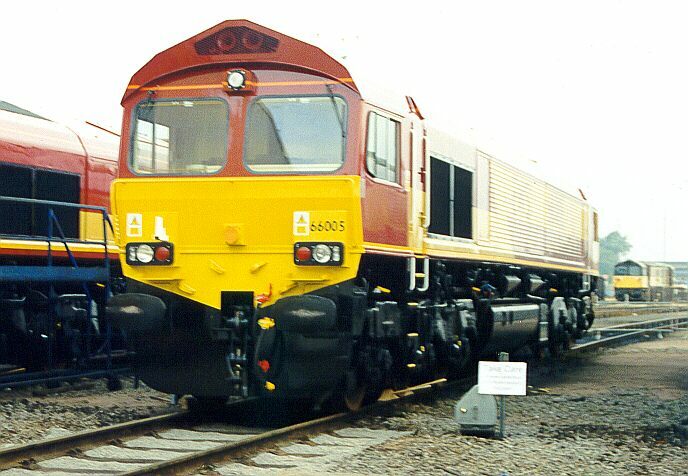 The new order for EWS, the GM built Class 66 is representeed in this view by newly delivered 66004 which is seen on display at the EWS Toton depot open day on Sun 30th Aug 1998. 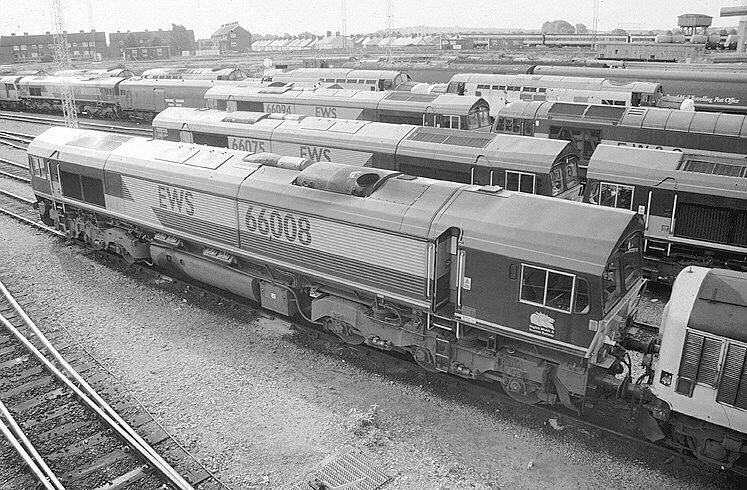 The new order for EWS, newly delivered 66004 stands alongside 66005 while on display at the EWS Toton depot open day on Sun 30th Aug 1998. 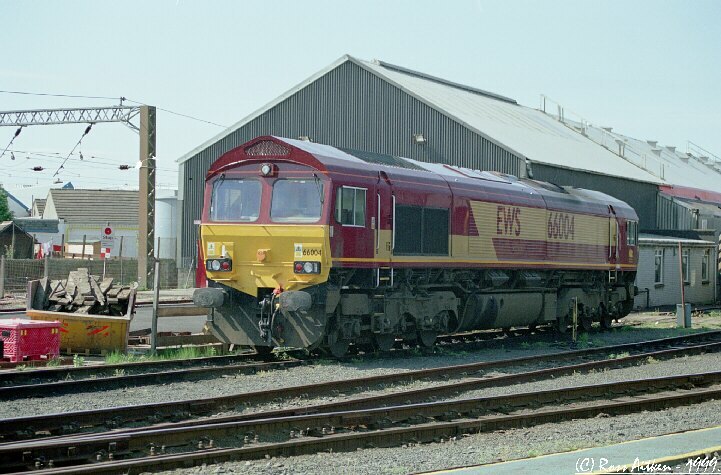 66004 stands at Ayr depot on Sat 15th May 1999. 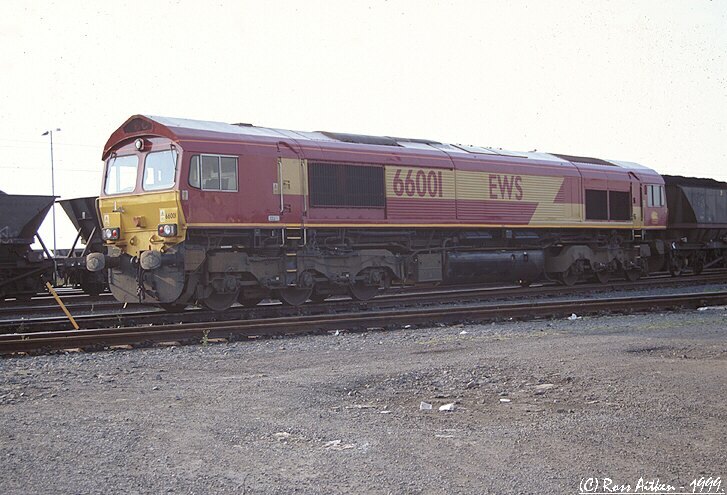 The new order for EWS, the GM built class 66 is represented in this view by newly delivered 66005 which is seen on display at the EWS Toton depot open weekend on Sat 29th Aug 1998. 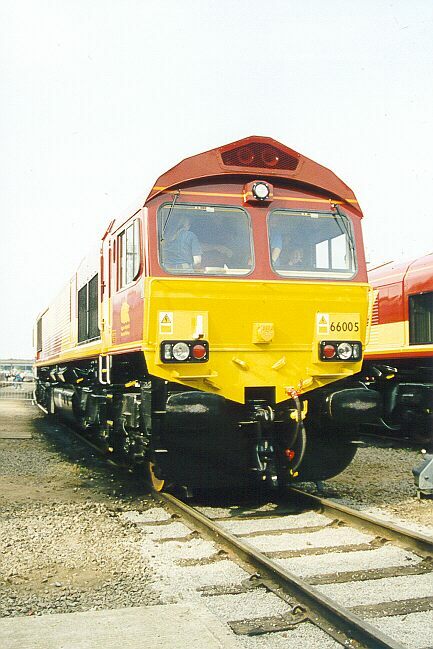 The new order for EWS, the GM built Class 66 is representeed in this view by newly delivered 66005 which is seen on display at the EWS Toton depot open day on Sun 30th Aug 1998. 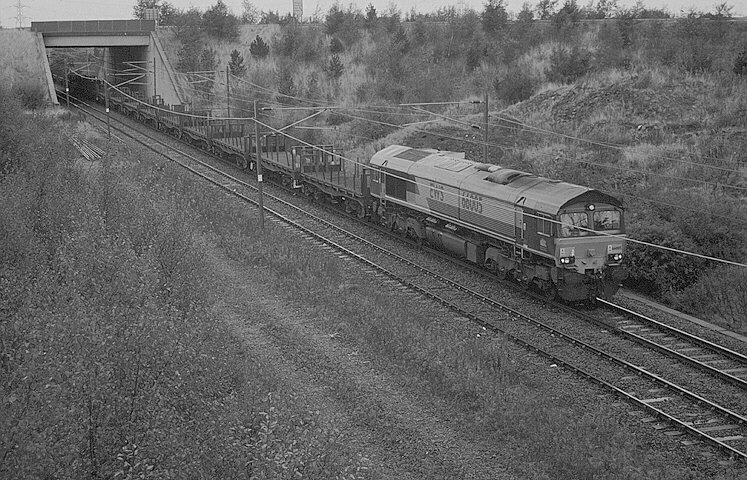 66005 arrives at Millerhill, Edinburgh with the 6E30, 13:29 Dalzell - Lackenby steel empties on Thursday 23rd September 1999. 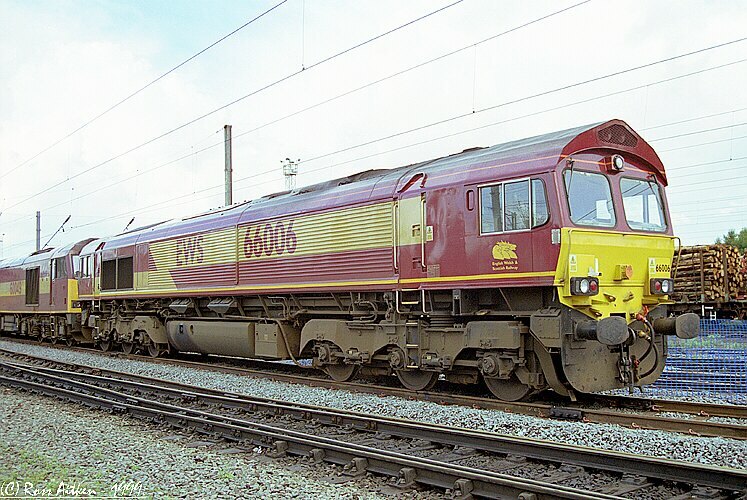 66006 lays over at Warrington LIP while awaiting it's next turn of duty on 14th August 1999. 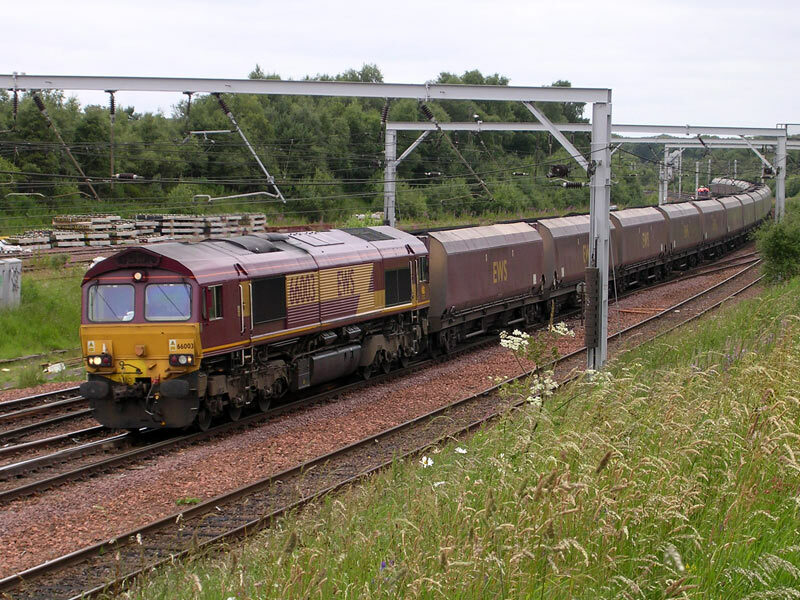 EWS Class 66 - 66007 approaches Carstairs with the 6E30 Dalzell - Lackenby steel empties on Fri 15th July 2005 at 13:44. 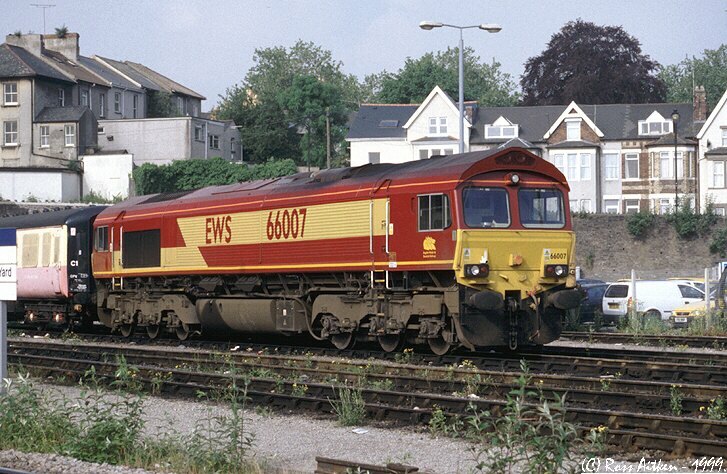 66007 stands at Newport Godfrey Road on Tue 1st June 1999. 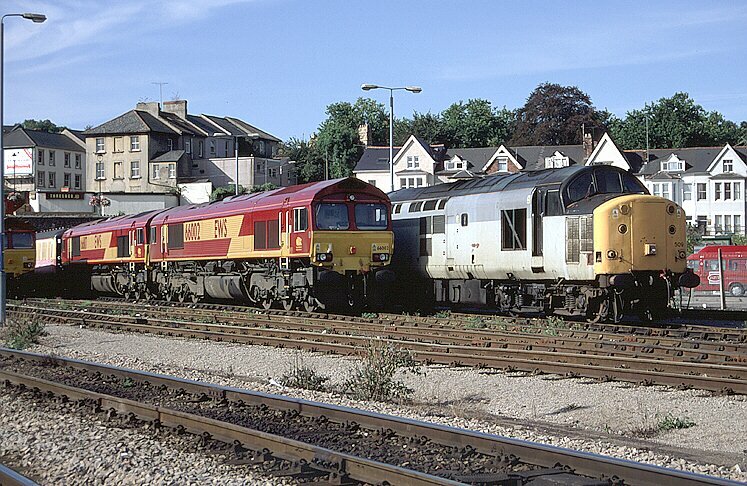 A line up of three 66's, consisting of 66008, 66075 & 66094, all stand at Cardiff Canton T&RSMD on Sat 11th September 1999. 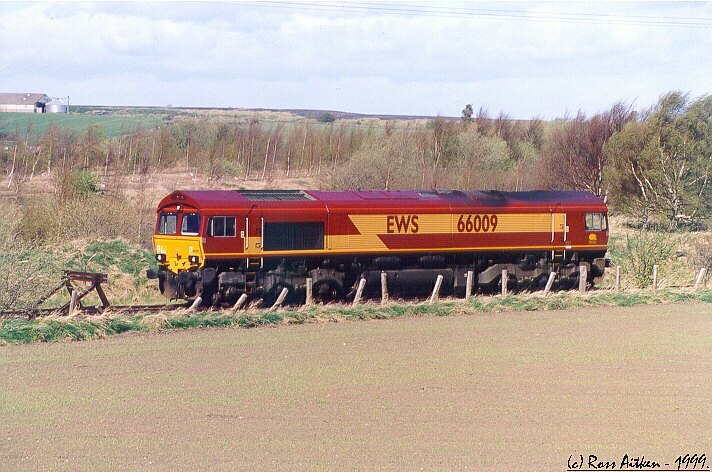 66009 stabled at the south end of Millerhill depot, Edinburgh on Sat 10th April 1999. Canon EOS500N, Canon 70-300mm lense (set at 115mm), circular polariser, tripod, 1/180th @ F5.6 on Fuji Superia Reala 100 film. 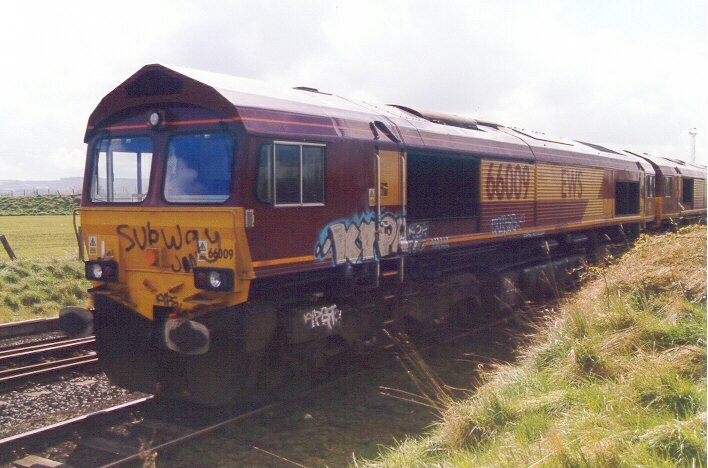 66009 stabled at the south end of Millerhill depot, Edinburgh on Sat 17th April 1999, shows signs of a recent graffitti attack which took place while stabled here. 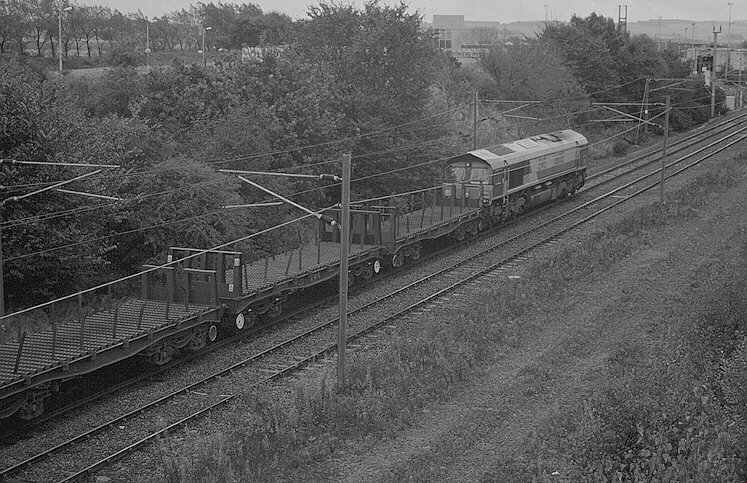 This has since led to these loco's being stabled in the main yard. Canon EOS500N, Sigma 28-80mm lense (set at 45mm), lens hood, 1/60th @ F5.6 on Fuji Superia Reala 100 film. 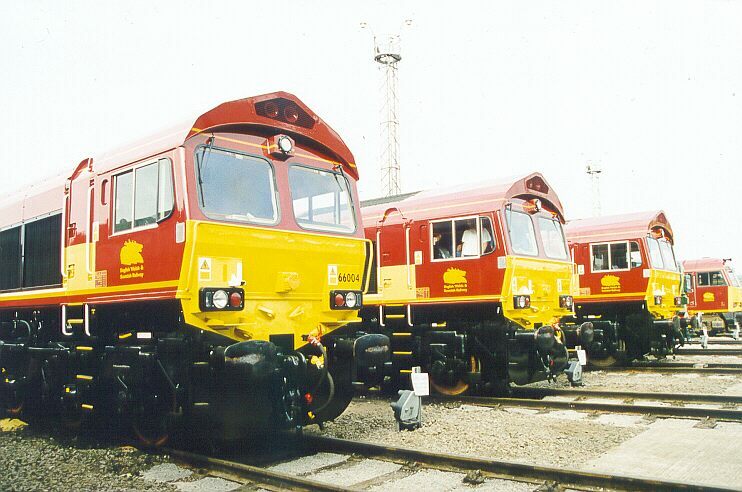 The new order for EWS, newly delivered 66004, 66005 & 66003 all stand side by side while on display at the EWS Toton depot open day on Sun 30th Aug 1998. 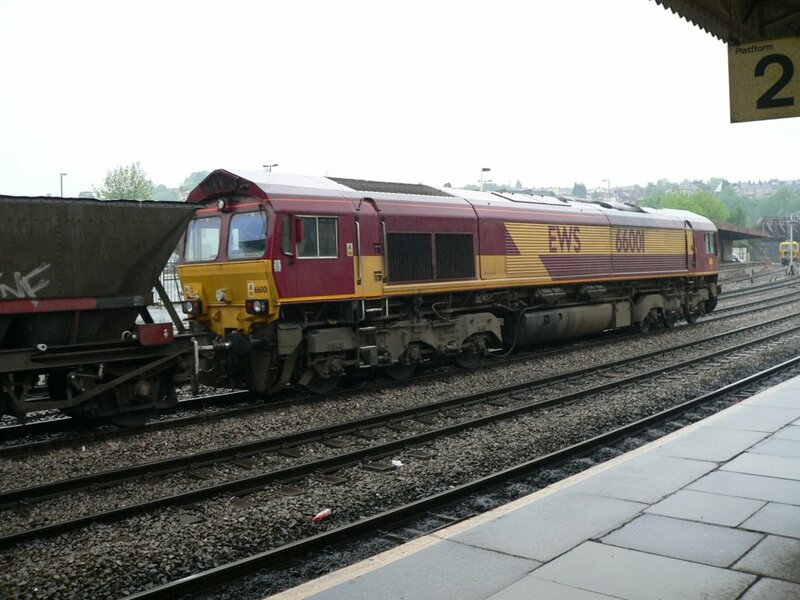 EWS Class 66 diesel locomotive 66001 - the first built of this very successful and now almost ubiquitous class - heads westbound through Newport in South Wales with a rake of (probably empty) hopper wagons as the rain pours down. 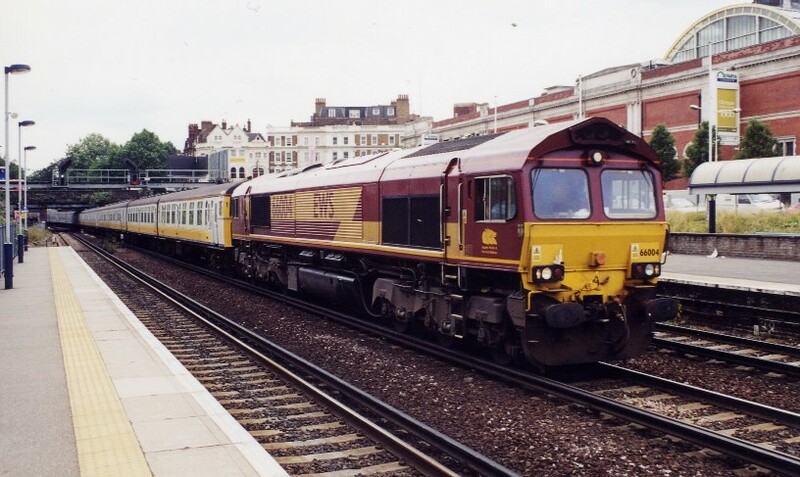 Double headed Class 66 units passing through Wandsworth Road, London on 23 July 1999. 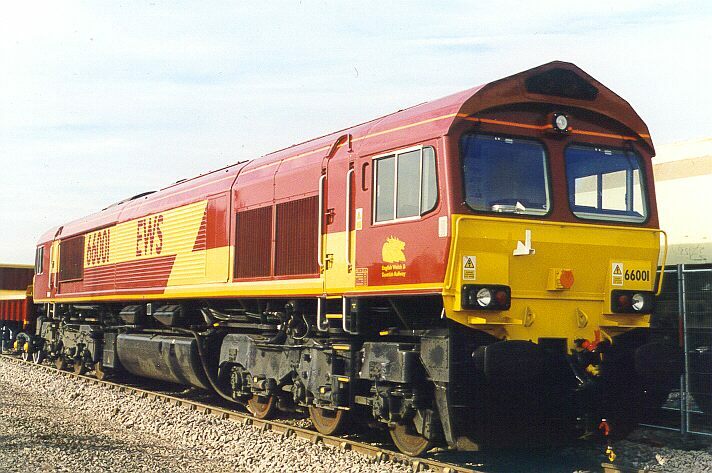 These units are the same as (basically) as the Class 59 units of Foster Yeoman. 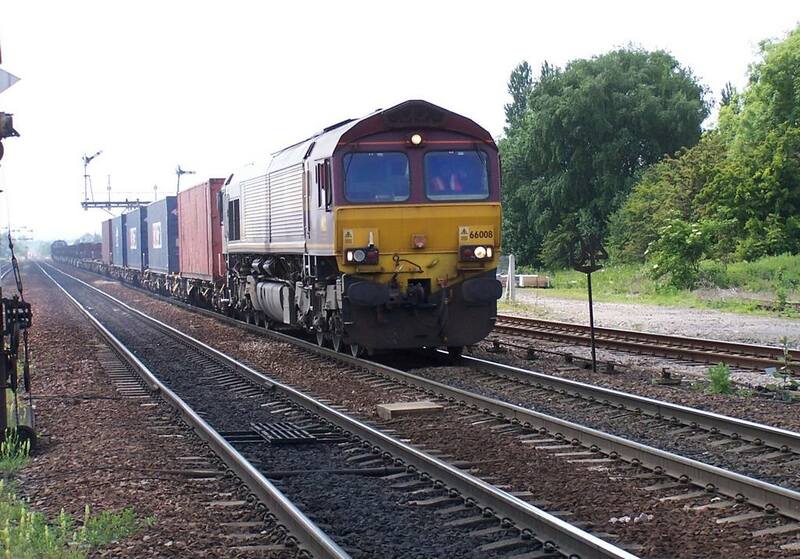 Brilliant sunshine and great location with plenty of action. 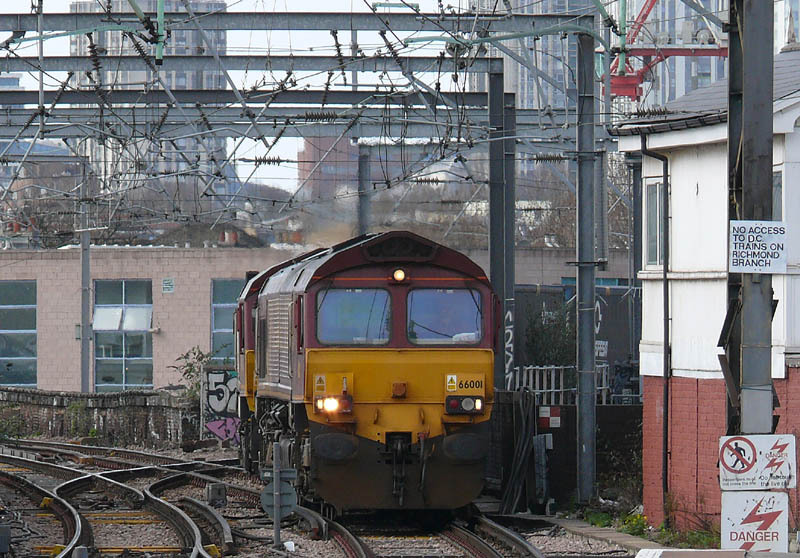 The pioneer of a locomotive class is always a bit special...even if it is a Shed! 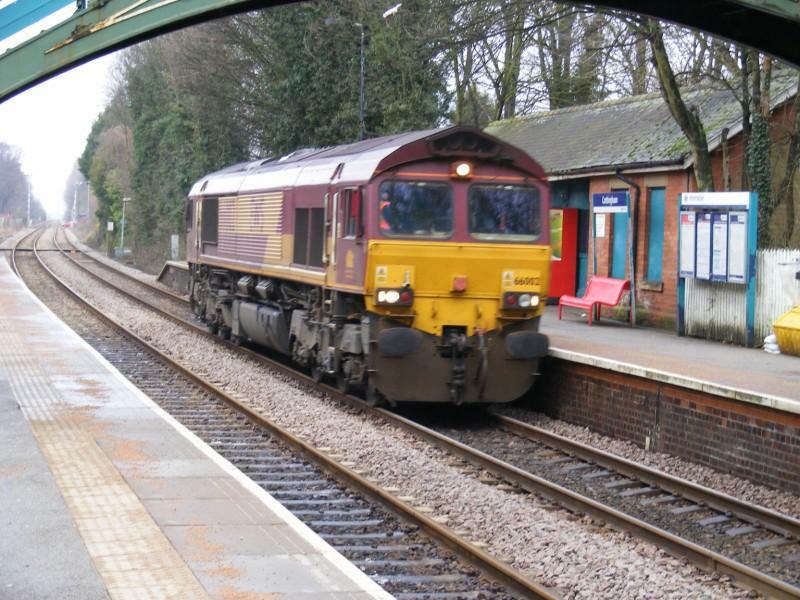 66001 is not having to work too hard as it is pictured trundling along the Barking to Gospel Oak Line near Crouch Hill on March 30th 2006. 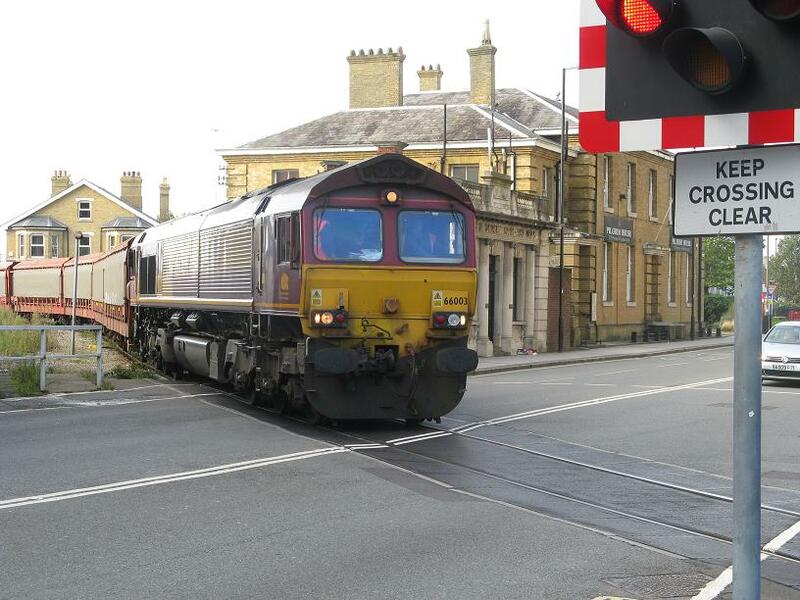 We had just got on a Silverlink train to Clapham when a text message said that the 'scrap move' was nearby. 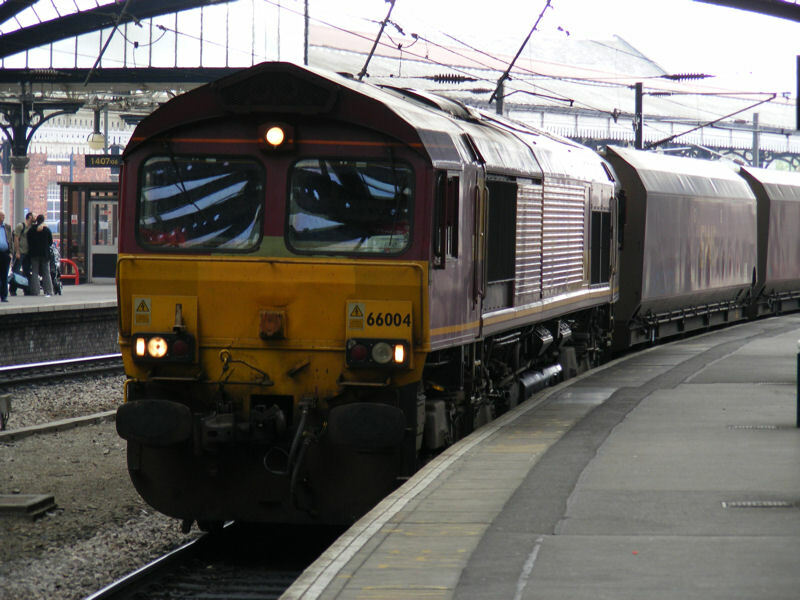 We quickly got off and 66004 with its 12 coach slam door stock appeared...but would we make it to Victoria in time now? 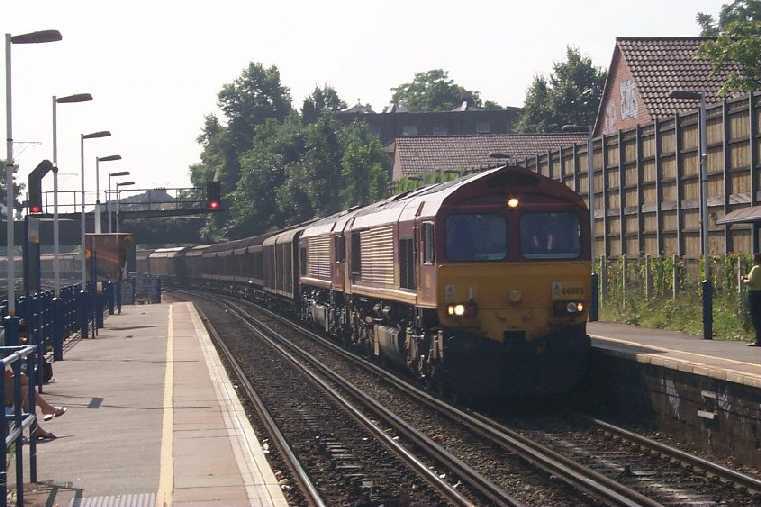 The date was the 22nd July and the place Kensington Olympia. 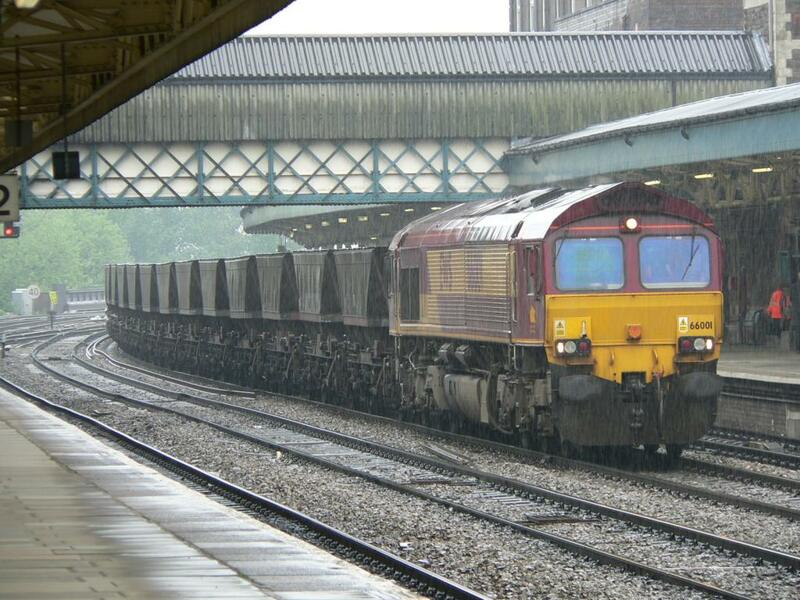 First Great Western Class 180 DMU 180108 and EWS Class 66 diesel locomotive 66001 in the pouring rain at Newport station in South Wales.